Able Muse Press, 9780986533839, 98pp. 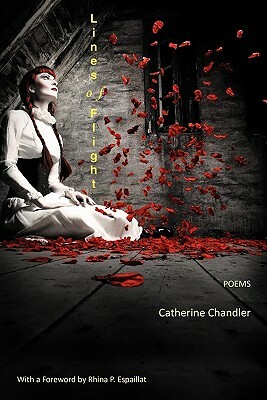 Lines of Flight is the first full-length collection from Catherine Chandler, an acclaimed American poet of quiet elegance whose simple style belies the range and depth of her poems. She is equally at ease with poems of nature as with those of people, relationships, landscapes and realms--the domestic, the foreign, even those scanning the vast unknown of space or the esoterica of science. These poems, carefully crafted with formal dexterity in contemporary idiom, are deployed with precision in a showcase of forms such as the villanelle, sapphic, ballad, pantoum, triolet, nonce, and the sonnet--Chandler's specialty, for which she won the Howard Nemerov Sonnet Award. Catherine Chandler's poems--I think particularly of the sonnet "Vermont Passage"--offer the reader a plain eloquence, a keen eye, and a graceful development of thought. Elsewhere in this fine book, she puts her gifts at the service of wit, as in the little anti-poetic poem "Supernova." Lines of Flight is altogether a lively performance. One of the things that poetry--when it's very good--does better than anything else is to suggest conflicting things at the same time and confront the reader with the possibility that both may be true. This book, which is extraordinarily good, does that to perfection. Catherine Chandler's Lines of Flight is a marvelously accomplished first collection. Even to call it a 'first collection' seems somehow misleading; it is a first collection as Housman's A Shropshire Lad was. These are poems that have been long meditated and patiently crafted; they are distillations of experience captured in exquisite measures. There seems to be no form of which Catherine Chandler is not a master, from quatrains and Sapphics to ballads and pantoums. She is an especially brilliant sonneteer. Her formal artistry is not on display for its own sake but is employed with often lacerating effect to probe "the hush/of who I am." These are poems steeped in the sorrows of lucidity. At the same time, she has a subtle eye for landscapes and foreign vistas, from Ushuaia to (even more exotic) Poughkeepsie. As she puts it, "Some things she loves for where they are." Her poems on natural things, particularly those on birds, are alive with the rush of wings. For, though she modestly denies it, she is a poet who can "explicate the texture of the air." Poem after poem offers what she calls "fugitive vignettes" and yet, despite her ironic title, there's nothing fugitive about her verse. These beautiful poems have been made to last. In Lines of Flight, we hear an engaging and authoritative new voice. Catherine Chandler displays a dazzling command of poetic forms, writing skillfully in the sonnet, ballad stanza, rondel, villanelle, cento, tercets--but to enjoy her work, the reader doesn't have to be a fan of form. A keen observer of the natural world, she can also capture human life in all its harsh crudity (see "Boots" or "To the Man on Mansfield Street"). She writes with drive and force, and yet is able to convey what she calls "the delicate forensics of the heart." Her instrument has many strings. She looks to me like a poet of major promise.